Seismologists have fingered glaciers as one source of newly discovered slow earthquakes. They translated previously undetected, long-period seismic surface waves as large, long-lasting earthquakes. If ice sheets movements in fact triggered the seismicity, then the new research might trigger a change in thinking regarding ice-flow mechanisms. 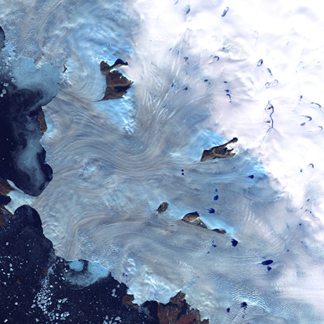 Large ice sheets that travel to the ocean, such as the glaciers in Baffin Bay, Greenland (shown here) can cause long, slow earthquakes. Image courtesy of NASA. Not many people feel these earthquakes, however, as they tend to be in geographically isolated regions. Using an algorithm keyed to long-period waves, the seismologists picked through recorded Earth surface movements over a three-year period of data. They identified more than 7,000 events, the smallest of which was magnitude 4.6. Of those, 521 had not been reported as earthquakes. Of that subset, the vast majority occurred at tectonic plate boundaries. But 46 of those earthquakes were squarely situated in glacier country: A handful of the earthquakes were traced to the Denali range in Alaska and the Antarctic coast. The rest were directly beneath Greenland, which currently has very few active faults. The team attempted to model sources for these long-period earthquakes, which proved difficult using standard fault models. Better fits came from landslide models. So the team invoked sources for the slow earthquakes that lasted longer and could set off seismic waves: fast movements of glaciers. Past research has shown that the quick movement of heavy ice sheets can create tiny seismic waves over a stretch of meters. But the long-period waves that set off magnitude-4.6 or larger earthquakes require ice surges lasting tens of seconds or more. The scenario Ekström and his colleagues suggest is of a huge sheet of ice dislodged by changes in meltwater at its base, or by a surge of rising ocean water, which might happen to the thick, wide glaciers that feed into the sea from the Antarctic and Greenland. The sudden lift would cause the sheet  on the order of 10 cubic kilometers or so of ice  to move abruptly over tens of meters. The friction between rock and ice would be enough to set off seismic waves. The stresses between ice and rock are much lower than those between two rock faces (as in a fault), however; so the smaller resulting forces create slower seismic wave accelerations in the underlying rock, Ekström says. He imagines an ice cube sliding on a slightly tilted rock surface: This ice cube will start sliding slowly and then pick up speed, he says. Then the glacier gets caught again as friction increases, and it slows down. The shallow slope lengthens the events. If such long, episodic ice discharges do produce slow earthquakes, wrote Mark Fahnestock, a glaciologist at the University of New Hampshire, Durham, in an accompanying comment in Science, then glacial models would require some tweaking  particularly if such episodic motions characterize the majority of ice movements from a glacier. Finding connections between these surges and known feedbacks, such as meltwater input pulses and ocean tides, may help to constrain the problem, Fahnestock wrote. Regular GPS measurements of ice sheets, which are so far lacking in Greenland and elsewhere, would help too, he noted. Hiroo Kanamori, a seismologist at the California Institute of Technology in Pasadena, says the observations of the slow seismic events are very interesting, considering that past results have not been particularly convincing. However, Kanamori says, researchers need to determine the relationship between slip, ice volume and episodic events. Other remaining questions, Ekström says, include why the team did not find slow earthquakes bigger than magnitude 5.0. The question of whether what we see is real has been settled, he says, but the implications for glacial behavior remain to be solved.